I am an eclectic writer. Join me as I share as the Holy Spirit leads me. I pray that my writing is glorifying to God and inspirational in some way to you! Monday I wrote about gentleness. I explored God's gentleness. I shared the Bible's tall order for a gentle Spirit woven into everything we do ... even confronting darkness. Let me be the first to tell you it isn't easy. Fortunately - God knows that too. He knows that the tender nursing mother becomes the mother of the tantrum-wracked mess flailing itself on the floor who resembles nothing of the contentedly cooing and helpless infant. He knows the wide-eyed wonder of watching your child discover creation and the awe washing over their innocent face ... only to see it mere moments later twisted in impotent rage, swatting savagely at the same face which was one of the first it saw and came to recognize as comfort. Monday's post filled my eyes with tears and my heart with conviction. I am not always gentle. My words are not soothing. In fact, of late I often hurt my children's "whole feelings" if not "all two of them." Of course I'm not trying to be mean, but my tone, I'm certain my facial expression, and even my posture likely betray my impatience. A raised voice admonishes them to keep their own voices down. Sometimes discipline, though not delivered with a heavy hand, is doled out with a hardened heart and an angry grimace instead of understanding and compassion. Gentleness has not been my strong point of late. Often when my girls are at their wits ends I ask them to go cool off. Maybe Mommy needs to start taking the time to cool off. Reconnect with the Father and ask for an extra heaping helping of His Spirit so that gentleness can flow from Him to my children. Nothing has tested me like motherhood. While I'm learning more about God's gentleness, I'm also seeing how little gentleness naturally resides in me. 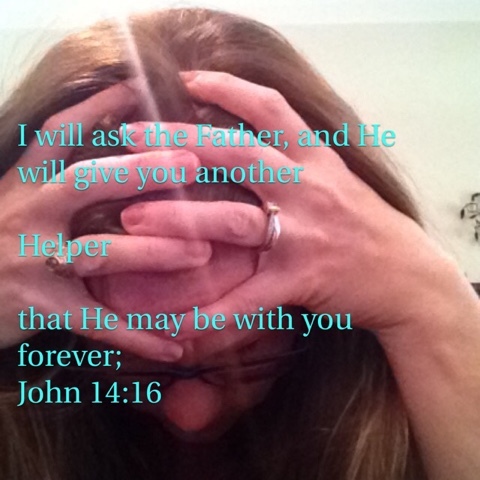 Praise God Jesus sent us a Helper. How much I need His help. Thank you so much for taking the time to read and comment! I am thankful you were here! I'm a 40 year old stay-at-home wife to Tim and Mommy to Shelby, Victoria, and RJ. I love God and my family. We are a homeschool, homemade, homestead-wanna-be family on some land in Central Texas. I used to be a forensic scientist - and if it weren't for the calling to stay home with these two girls I wouldn't have left it! I taught middle school science briefly ... and now you know part of the reason we have chosen to homeschool, ha ha! Tim is currently a paramedic student ... he's also a former builder, diesel mechanic, and he’s been a paramedic before so really he can fix just about anything that happens around here and we sure do appreciate it! Transformation Tuesday - Why Shakeology?